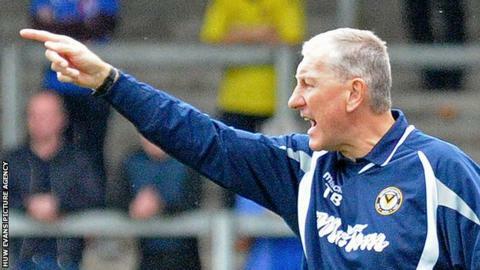 Manager Terry Butcher hopes Newport County's first win of the season will galvanise his side's League Two campaign. Debutant striker Tyler Blackwood, on-loan from Queen's Park Rangers, came off the bench to secure a much-needed 1-0 victory at Carlisle United. County remain bottom of the table but Butcher was delighted after securing a win at the ninth attempt. "It's onwards and upwards now," former England captain Butcher said. "No matter how we did it we've done it and it's nice to break that hoodoo. "Four points out of six is lovely and on the road as well coming to two difficult places." Butcher's side had secured their first away point of the season against Dagenham & Redbridge the previous weekend. The Exiles host fellow strugglers Crawley Town on Tuesday and welcome Exeter City to Rodney Parade on Saturday. Off the field, Newport County Supporters' Trust is £55,000 short of its target of £195,000 to take over the club from current owner Les Scadding. A deadline has been set for the end of the month but Butcher hopes results on the pitch will have a positive impact on the Trust's efforts. "Hopefully we can give the supporters and the Trust some wins and put a smile on their faces," Butcher added.